I have been trying to work out a way to wear drop earrings for a while. 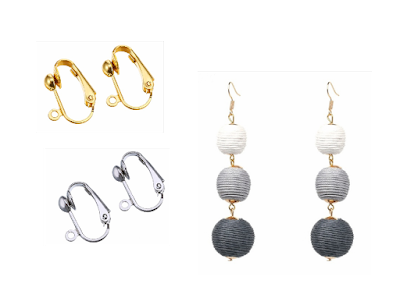 I have several clip-loop earrings (post/pierce style) with spring backs where I have cut off the post. That works, however the "how to wear" the ultra-feminine drop / dangle style has alluded me. I know, just get your ears pierced - That is for another day. What I did find on Amazon is the "Bememo Earring Converter". It is a DIY project that allows you to convert any hanging post style to clip. The package contains 36 and you can order gold or silver. The way it works is obvious and only needle-nose-pliers and patience are required. Easy and I find they hold even with heavy solid ball earrings. The spring back can also be adjusted in several ways to provide a better hold because of the soft metal. Has anyone found anything better or have any other suggestions? I got mine pierced on March 3rd. You can do it Rhonda! I have also learned to convert non-drop pieced earrings to magnetic earrings using rare earth magnets. I use white gorilla glue after taking the stud off with another magnet glued to the back. You can even put the stud through the back to make it look more authentic.